Let me start by saying I’ve managed to be a little more focused, well today I was a little more focused. Yesterday, not so much. Nothing on my list got done, but I realized (as we all need to do) when I am scattered I need to sit down with my beloved paper and refocus. Yet another lesson in this seeking to manage time and thus our lives. We must come to know ourselves. We can’t work someone else’s system or plan. I like paper, you may not. I like paper and you may too, but you like room to doodle, stickers and large spaces in which to write. I like compact, lines, and a few key tools to keep things in order. 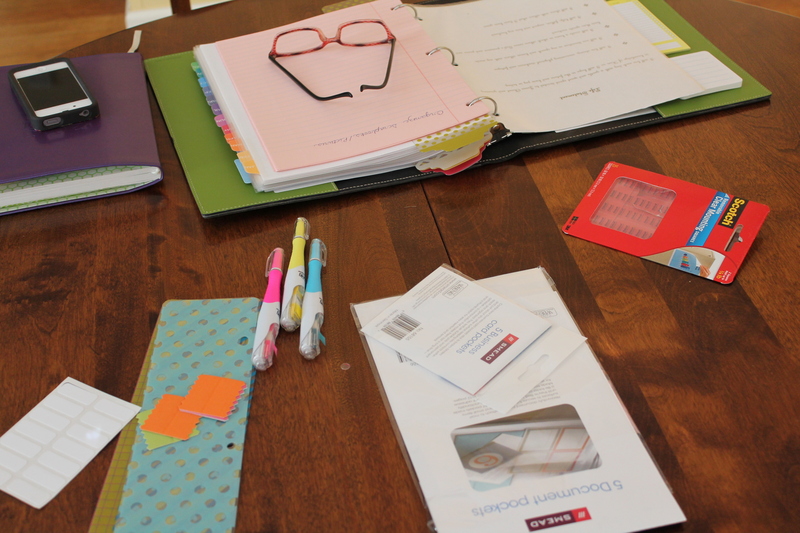 So, yesterday I had to accept that I wasn’t going to get very far with my attempts to refocus until I gave myself permission to sit down with my paper planning system and re-group. I even went so far as to give myself permission to go buy a few new tools, a couple of fun, pretty items to get me motivated. I had a blast and the stress of feeling “out of sorts” and the frustration of feeling less than pleased with my performance began to melt away as I perused a few of my favorite stores. It was a beautiful, crisp fall day. I allowed myself time to look through all the scrapbook supplies (a great place for picking up organizing items to use with your calendars or planners), check out the new 2014 calendars, and play with the assortment of pens at Hobby Lobby and Office Depot. While some might think me crazy, this is my outlet. This is what can re-charge me. Either playing with office products and organizing items or baking. It’s me, and to stay focused, to continue on towards the goal set before me, I must embrace me. I came home with just a few new supplies (under $30.00). I came home refreshed and motivated. Out it all came. And in but a mere 45 minutes I had re-grouped, re-focused and had a clear plan of action for today! The work table in the kitchen looked like this: The iPhone for looking at the monthly calendar. I keep all our major appointments and events on a shared monthly calendar (color coded for each family member). The purple planner you have seen before. It is a weekly planner I purchased at Barnes and Noble. And yes, they have some new ones in stock! I transfer my appointments and tasks here. 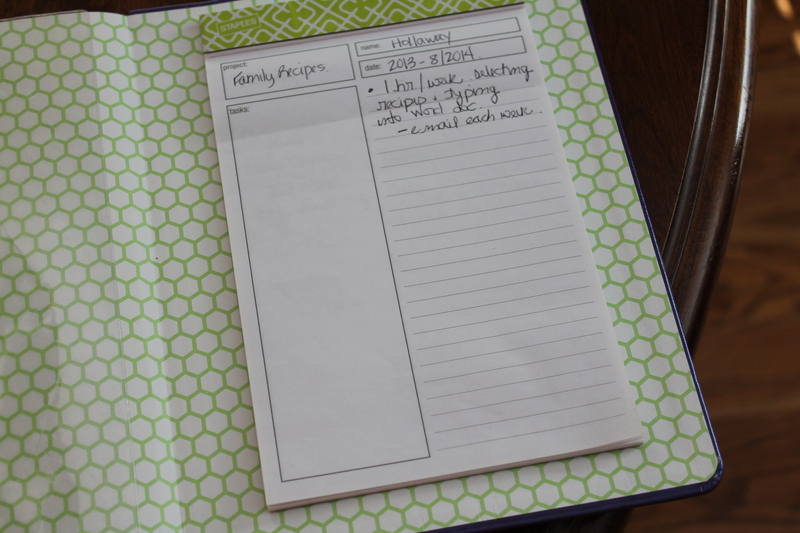 The big green binder (my favorite color) is my blog planner, monthly info catcher, goal setting planner etc… It has tabs for each month, page protector behind each monthly tab to hold invitations, tickets, receipts and other items pertaining to events or tasks that month. 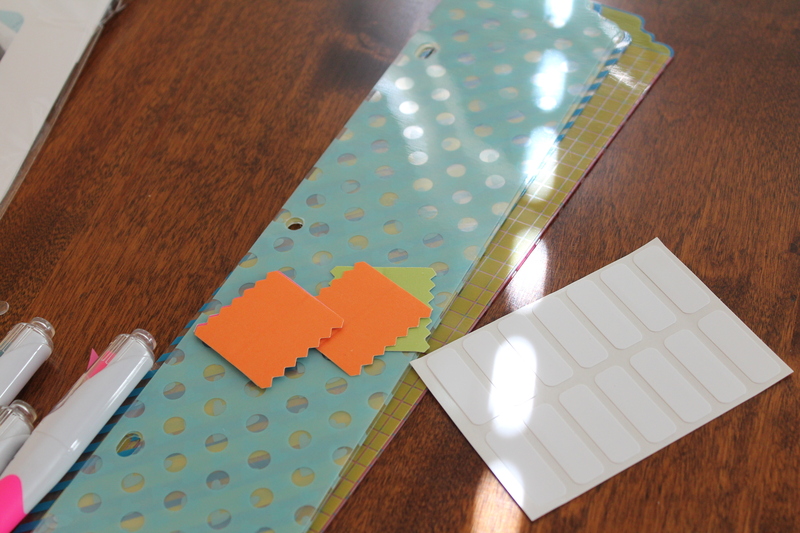 I found the cute plastic tab dividers at Hobby Lobby in the “Project Life” section. LOVE!!!! Time to add a few new tools and make certain I really new what was on my plate to be completed before my October 31 planning day. (See previous post to learn about my 31st mini-retreats.) I threw away a few items, went ahead and printed my 2014 blog planning pages, added some new pens and post-its. “Project Life” plastic tabs for dividing sections. 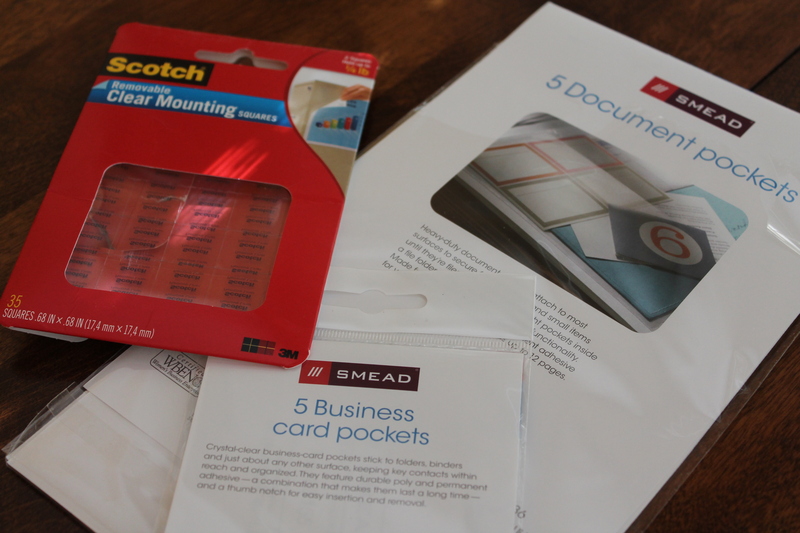 Post It tabs, Post It notes, document holder, business card holder and new pens in pouch. 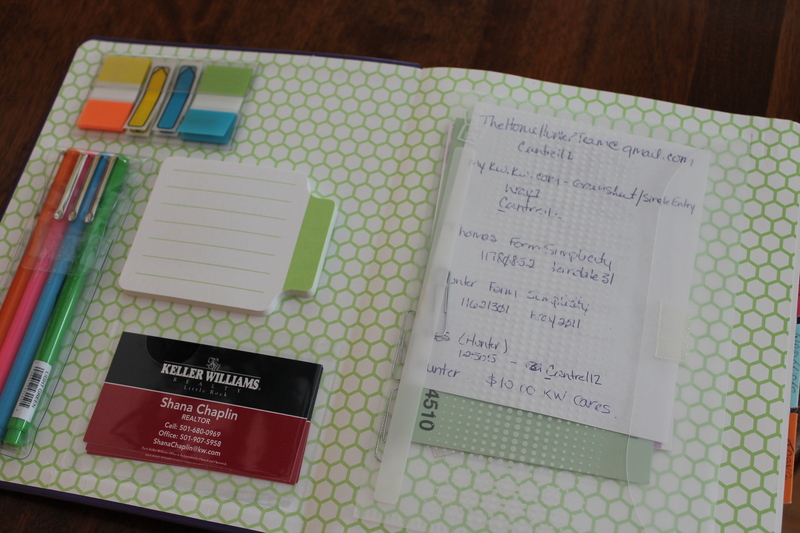 Scotch mounting tabs and document folder to adhere to inside planner cover, along with business card holder. In the back of the weekly planner I have mounted another document packet and a small notepad on which to keep my running “to do list” for each project. I only track current projects here. Long term projects or goals stay in the green notebook until I hit a period when I am engaged weekly in the project. This helps me keep up with tasks, gives me a place to take notes on any given project, and if I start flipping through too many pages I am reminded I need to re-evaluate how many things I have committed myself to. It was fun getting a little creative. Most of all though, it was just a simple exercise in giving myself permission to breathe and re-group. Once I had looked over my list, made certain the calendar (monthly and weekly) were up to date, crossed some items off, and ripped out a few completed project pages, I was ready to focus. I felt “in control” again. It was a little mini purge for my brain. It was easy after that to create my to do list for the rest of the month. It also gave me a little boost as I await my little mini-retreat on October 31st. Today’s lesson: Embrace you. Be creative. We all need a system, but just as we are each unique in our looks, personalities, talents and gifts, we can be unique in how we manage our time. If like me, you have felt fractured, a little out of sorts, take a breath. What re-energizes you? Grant yourself permission to do it. The tasks will still be waiting. You’ll return refreshed and with new zeal. This Second Season is kind of nice. It’s nice to know myself. Your pictures are great. I especially like the project planner.